In a recent test of steel guards on the back ends of large truck trailers, the only manufacturer whose guards passed all the accident tests was the Canadian manufacturer Manac. 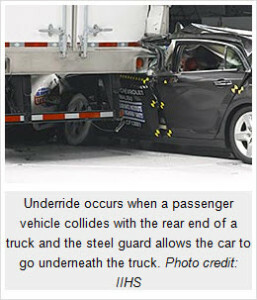 The steel guards protect against “underride,” which happens when a car collides with the rear end of a truck and goes underneath the truck. Because 18 wheelers sit so much higher than most passenger vehicles, the results of underride are often life-threatening injuries and decapitation of those in the front seat of the passenger car. Canadian regulations require stronger steel guards than U.S. regulations. In the crash tests, all 8 tested models withstood a “full-width” crash and all but one passed a 50 percent overlap (in which only half the width of the car hit the rear of the truck). Only Manac passed the 30 percent overlap test. The IIHS has advocated for tougher standards for steel guards, but those calls have not resulted in any changes in steel guard standards in the United States. What has caused the improved strength in steel guards, the IIHS suggests, is the higher standards in Canada, where many American trucking companies also do business. The Law Offices of Frank L. Branson provides legal representation to victims of trucking and other commercial vehicle accidents.